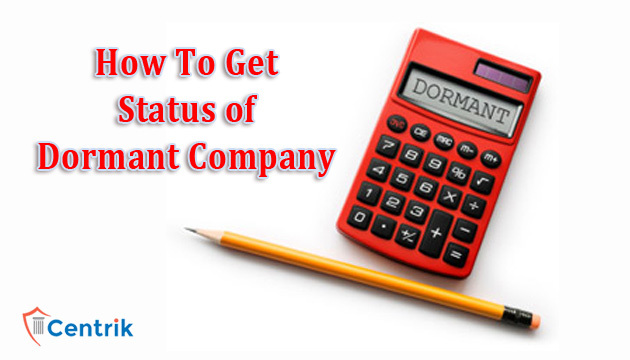 What is and how to get Status of Dormant Company ?? CentrikBlogsBusiness AdvisoryRegistration And ComplianceWhat Is And How To Get Status of Dormant Company? What Is And How To Get Status of Dormant Company? A Dormant Company is the one which is a registered entity but is not currently active. It doesn’t trade & has no significant accounting transactions. Companies can either opt for having a Dormant status or in case of inactive companies the Ministry of Corporate Affairs declares that company a Dormant. Having a Dormant Status saves the Company from complying with various compliance’s and could be cost saving. A) What is all that? 1) Companies Act 2013, says where a company is formed and registered under this Act for a future project or to hold an asset or intellectual property and has no significant accounting transaction, such a company or an inactive company can apply for being dormant status. 2) A dormant company can apply to revert back to active status company. 3) A dormant company cannot remain as a dormant company for more than 5 consecutive financial years. B) Why would a company choose to be a Dormant Company? Now, the question arises why would someone opt for dormant status or why not shut it down? a) Many people set up their company but it often takes people a while to actually get the business. b) Some people might have an idea and want to get their company registered so that everything is ready once the project comes together. c) To protect themselves from copycat companies. When present business is not running that smooth, then the Company decides to halt for some time and start again when circumstances change.So in such case should a Company shut down completely? No, it can opt for dormant status. C) Eligibility to be Dormant? Company which is not doing business for two financial years and is not intending to do any business in the near future for up to 5 years can make an application to place its status as a dormant company. D) Procedure of getting the status? Eligible Companies can make an application for obtaining status of dormant company in form MSC-1 along with the fees to the ROC. 1) No inspection, inquiry, or investigation has been ordered or taken up against the company OR no prosecution has been initiated against the company and pending under any court. 2) The company does not have any public deposits or interest thereon outstanding for payment. 3) There is no outstanding loan, secured or unsecured. If there are unsecured loans then consent of the lender should be obtained and enclosed along with the form. 4) There should be no dispute or difference amongst the management or promoters of the company and a certificate to that effect is enclosed. 7) It is not a listed company. 1) A dormant company shall file an annual “Return of Dormant Company” in form MSC-3 which shall be duly audited by a chartered accountant in practice. 2) A dormant company is still required to have minimum directors, hold minimum two Board meetings. G) Exemption to Dormant Companies? 1) No need of cash flow statements in their financial statements. 2) Holding board meeting in each half of the calendar year with a gap of at-least 90 days. i.e. only two board meetings mandatory during the year. 3) Provision relating to the rotation of auditors not applicable. Whatever the reason for having a dormant company it is important to keep make sure the process is done properly. If you are thinking of making your company dormant and need any help with the process get in touch with us. Yes I am interested to keep my company in a Dormant status.